It's been a long time since I've pulled out baby books to review. When Bookworm1 was a baby, we used Roger Priddy's Happy Baby series to acquiant him with the lovely world of books. Now we're preparing to bring another young one into our family and I have to back up a bit with my reading ages and, of course, explore new titles and see what else is out there! 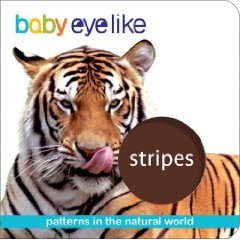 The Baby Eye Like series is designed to teach young children concepts about the world around them through use of pictures of the natural world. Very much like Roger Priddy books, the Baby Eye Like uses good, clear photographs as opposed to illustrations to "tell the story." I really appreicate the use of photographs in books (not just because I am a photographer) but because my son seemed to have a difficult time identifying animals correctly if they were too cartoon-y to the point where they would drift away from reality. (Apparently my child is very black and white in nature -- also like his mother!) Therefore, although he is 2 1/2, he is attracted to these books and enjoyed looking through them. This series is quite large, with lots of titles and subject matters addressed. The two books that brought out the strongest reactions from my 2 1/2 year old were the books on spots and stripes in the natural world. (Of course, these were the two more complex picture books which might have had something to do with it!) There are a lot more items to look at on these pages and the patterns and designs are busier. In each book there is a circle cut out, revealing the title of the book. Therefore as you turn each page there is a circle of space missing from it. Frequently the circles are placed strategically on the object or animal being photographed to further explain the concept. For example, in the Circle , Square and Triangle books, the appropriate shape is cut-out on each page, highlighting the shape that the child is to be looking for and identifying. These books are stury, well-made and dependable. What helps make them dependable? Frequent use of cuddly (and otherwise) looking animals. My son LOVES animals and I've yet to hear of a kid who doesn't. There is something about animals that attracts us to them. They look cozy. They look friendly (as long as their mouths are shut and their tongues are not slithering out). One particular book in this series did a good job of illiciting sighs and smiles from us. 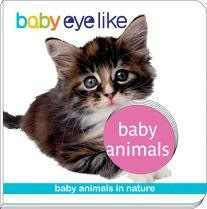 Baby Eye Like: Baby Animals is filled to the brim with soft looking kitty cats, cozy bunnies, curled up and adorable looking hedgehogs, and fluffy baby lambs. As we flipped through the pages, Bookworm1 declared them all to be, "CUTE!" Every single page. Every single animal. Cute, cute, cute! As I said, there are a lot of titles in this series to choose from, including: a counting book (How Many? ), an alphabet book (Discover Letters ) and books devoted to teaching children particular colors (Purple , Yellow , Orange , Blue ). These books are fun, curious, bright and cheerful. The winner of this contest was Jennifer @ Snapshot. Congrats! I'll be mailing the book off shortly. If you like the sound of these books but would appreciate a similar series for older kids, check out what Dawn and Jennifer had to say about the Eye Like series for pre-schoolers and school aged children over at 5 Minutes for Books. Not entering the contest here, but just wanted to say that these look just as adorable as the older books-- such incredible photography and clear images. 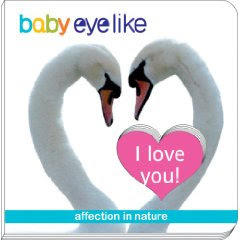 And I LOVE the swan-heart. Too beautiful! I believe my daughter would love these books. great review! Yes of course I want those books! These would be great books for learning. Please count me in the drawing. Thanks. Okay--so I AM going to enter the contest, because I have two sister-in-laws who recently gave birth, so IF I won, I'd love to send them along to them. I don't often enter book contests (because -- well you know why), but these do sound great. I am a children's book enthusiast! These look so cute! I would love to win one. Ooh, we got some of those from the library! I'd love to get some for the twins. That looks like a great series thanks so much for sharing! Those look like awesome books! I love Roger Priddy's books (am slowly collecting all I can find) and would love to introduce this new series to my little Buckaroo (13 months) who is quite the bookworm himself now. His two favorite type of books are Priddy's and any that have cut outs/touch features. Given your review I think this new series might become his new favorite! These books look adorable! Theu'd be perfect for my niece!